The 30-year fixed-rate mortgage (FRM) averaged 4.28% with an average 0.4 point for the week ending March 21, 2019, down from last week when it averaged 4.31%. A year ago at this time, the 30-year FRM averaged 4.45%. The 15-year FRM this week averaged 3.71% with an average 0.4 point, down from last week when it averaged 3.76%. A year ago at this time, the 15-year FRM averaged 3.91%. The 5-year Treasury-indexed hybrid adjustable-rate mortgage (ARM) averaged 3.84% with an average 0.3 point, unchanged from last week. A year ago at this time, the 5-year ARM averaged 3.68%. Last week was a down week. The Down Jones Industrial Average ended down 1.34% to 25502.45. The S&P500 ended down 0.77% to 2800.71, and the Nasdaq Composite finished off 0.60% to 7642.67. The annual yield on the 30-year Treasury ended off 13 basis points to 2.89%. Economic news for the week centered on the U.S. Federal Reserve’s decision to leave rates unchanged, but, more importantly, revised expectations toward no further rate hikes in 2019. Manufacturing sentiment surpassed expectations, as did data for housing, jobless claims, and a composite of leading economic indicators. However, weaker data abroad appeared to outweigh these benign results. Global equity markets bounced around in the positive during the week before ending in the red by Friday. Due to investor risk aversion away from stocks, bond markets rallied as yields fell to lows not seen in months. Commodities gained a bit, due to slightly higher oil prices, but other segments ended the week mixed. (0) As mentioned earlier in the week, the FOMC left rates unchanged, but most of the news, during the post-release press conference, and later analysis, was focused on the ‘dovishness’ of the evolved stance. The new projections have been lowered to show no hikes expected for this year, which was somewhat expected, and calmed investor fears that, if the ‘dot plot’ didn’t realign with market expectations, and a hike or two was still forecast, a mismatch could exacerbate further market volatility. All of these expectations were aligned this month, however. The Fed’s balance sheet runoff, consisting of letting the balance of excess treasury and agency mortgage assets shrink over time, is now being slowed down and will end in Sept. The important part about all of this news is that the Fed is acknowledging conditions aren’t as robust as they once were, which is why it can afford to be ‘patient,’ as the risks of slowing and expansion are roughly balanced. Some might call this neutral stance ideal, but markets never appear overly happy with what the Fed is doing. (+) The Philly Fed manufacturing index rose by 17.8 points back into positive territory at 13.7, beating forecasts for a less dramatic gain to 4.8. Under the hood, new orders and shipments increased further into expansionary territory, while employment fell several points, but still remaining positive. Expectations for business activity six months out remained expansionary, but fell by nearly -10 points on the month. (+) Existing home sales for February rose by 11.8% to a seasonally-adjusted annualized level of 5.51 mil. units, far surpassing the expected increase of 3.2%, and representing the highest levels in a year. Single-family units rose by 13%, while condos/co-ops were unchanged for the period. Regionally, the West and South saw gains of 15% or more, followed by near-double-digit gains for the Midwest, while sales in the Northeast were flat. Days on the market also declined a bit. 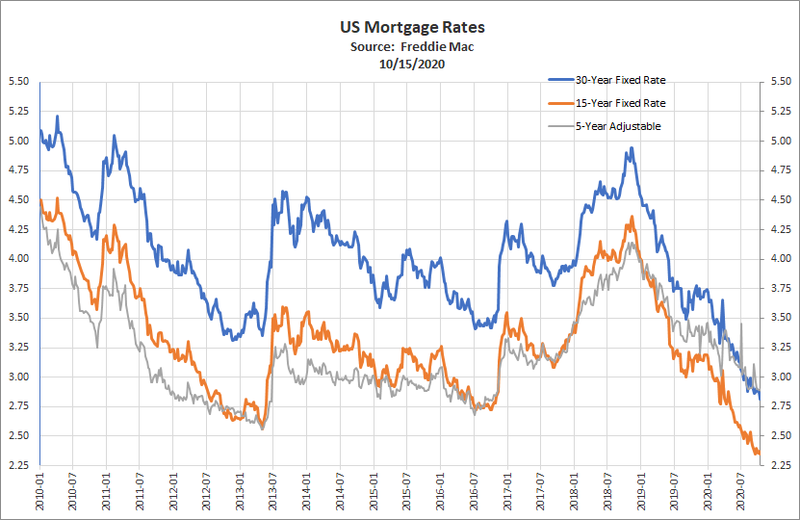 Compared to last year on a non-seasonally-adjusted basis, sales are similar, with inventories remaining a constraint but the recent decline in the 10-year treasury note yield has also pulled down mortgage rates, which eases financing conditions dramatically. (0/-) The NAHB homebuilder index for March was flat at 62, versus expectations for a slight increase by a point. While prospective buyer traffic fell by -4 points to reduce the overall figure, the other two components of current and future sales each rose by a few points. Nationally, three of the four primary regional index rose, led by the Northeast, up 7 points, while the Midwest fell -5 points. This was a decent but unexciting reading, as the spring building season begins. (+) The Conference Board’s Index of Leading Economic Indicators for February moved back into growth mode, increasing by 0.2%, the first increase in five months and moving beyond a flat January and slight drop in December. Monthly contributors were led by the financial components (stock prices and yield spreads), which offset lower manufacturing hours and somewhat higher jobless claims. Growth over the past six months, the index rose at an annualized 1.1% rate, which was substantially below the 5.1% annualized rate of the prior six months—indicative of the broader slowing seen in the economy through a variety of data points. The coincident indicator also rose by 0.2%, while the lagging indicator was unchanged for the month. The coincident number over the past six months increased by an annualized 2.3%, which was a bit slower than the 2.7% growth rate for the prior six-month period. As we tend to point out, the LEI is simply a compilation of data we already know, the combination has tended to be quite powerful as a predictive gauge on economic conditions. In fact, it’s also been one of the fastest, with a recession occurring historically within six months of a substantial negative turn in the series. (+) Initial jobless claims for the Mar. 16 ending week declined by -9k to 221k, falling below expectations calling for 225k. Continuing claims for the Mar. 9 week fell by -27k to 1.750 mil., a fair amount below the 1.770 mil. expected. No anomalies were reported, as claims levels continue to run at very low levels. U.S. stocks fared decently until Friday, when poor industrial sentiment data out of Europe pulled global equities lower. Equities had rallied slightly following the dovish Fed statement mid-week, due to signs of slowness already, with investors now even more sensitive to conditions morphing into a trend of ‘too slow’. Threats to earnings for technology companies seemed to add fuel to the fire, as did the continued tumble in bond interest rates, which raises equity investor fears of ‘what am I missing?’ (as bond markets have often led equities in terms of the absorption of news). By sector, consumer discretionary and staples fared best, with positive returns on the week, while financials were pummeled with a -5% loss—due to the lower rates and continued lack of positive slope in the yield curve needed for bank net interest margins to remain profitable. Foreign equities struggled, albeit to a lesser degree, despite growth concerns in Europe taking the forefront—stocks there underperformed those in the U.K., and Japan, which gained. Manufacturing PMI in Europe reported its worst reading in six years, led by Germany, and moving further into contraction—which again reinforced the slowing of growth on the continent. Services, however, remained expansionary. The EU granted the U.K. an extension for Brexit, until May 22 if a withdrawal agreement can be agreed upon by Parliament next week, or only mid-April if they cannot. Political wranglings in the U.K. remain a sizable headwind to markets there, with almost too many variables to handicap, including the remaining longevity of Prime Minister May’s tenure, the possibility of a second public Brexit referendum (the movement for which appears to be growing in popularity), as well as the obvious fluid timelines for any type of workable exit agreement. Emerging markets bucked the trend a bit, by ending the week in the positive, with gains in China and peripheral Asia in keeping with Chinese economic and monetary stimulus being announced after the annual National People’s Congress meeting. A variety of emerging market central banks met last week, including Brazil, Russia, and others, with all keeping rates at status quo. A bottoming in emerging market economic data and political uncertainty (relative to Europe, anyway) seems to be increasingly aiding sentiment. U.S. fixed income experienced a very strong week, with governments and investment-grade corporates each nearly earning 1%, and the yield on the bellwether 10-year treasury note surprisingly falling below the psychologically-important 2.5% level. Bank loans lost ground due to widening spreads and, obviously, lower rates. A little-changed dollar for the week was not an impact on foreign bonds, where developed market treasuries gained ground in line with U.S. issues, and emerging market debt was mixed. The unusual partial U.S. treasury yield curve inversion continued, with the 10yr-3mo spread now inverted, but the 10yr-2yr isn’t (yet). However, the 30-year component remains well out of harm’s way with ample term spread over short-term debt. All of this reiterates the uncertainty markets have over recession risk and Fed policy over the next several years. In contrast to equities, real estate fared well, with positive returns, helped by the usual boost of lower interest rates. Asian REITs also experienced gains, which offset minor declines in European real estate. The Fed moving in a dovish direction has typically resulted in a strong boost to sentiment for real estate assets in the near term, due to effects on the discount rate and borrowing costs. Commodities gained slightly on net, with gains from agriculture and precious metals offsetting weakness in industrial metals—with the latter often tracking risk asset returns. Energy was flat on net, with a decline in natural gas prices offset by a gain of just about 1% for crude oil. Crude rose above $60/barrel during the week before settling at just over $59 by Friday. A meeting of OPEC members last week reaffirmed a near-term policy of production cuts to boost crude prices, which reinforced the tide of prices upwards, while risk aversion tempered a bit of that effect by later in the week.